Discussion in 'Amps and Cabs' started by Al Rose, Sep 14, 2012. Hello all. I know this has been discussed some before, but I've got a 12" V30 in a Lopo cabinet. It has about 150 hours on it, and it still seems to be "breaking in". Noticed at practice the other day that it sounded a bit smoother than last weekend. Have noticed over the last 6 months three or four times when it seemed to have gotten better. So the question - how long does it really take for them to break in? For my home hi-fi, speakers have normally taken about 100 hours before they stop improving, tubes about 20-30 hours. I remember one thread here where someone said a V30 can take a long, long time. So, any thoughts? I've also got a G12T-100 in another single 12" cabinet, and it's still a bit shrill at maybe 75 hours or so. Same thing? 150 hours should have been more than enough. If you feel its not their yet play through your clean channel with the bass and volume cranked up a bit. That will get that sucker moving and not sounding so stiff anymore. Agreed, that should be broken in by now. I noticed a big improvement to mine by just wailing on them really loud with a clean tone, middle pickup for a few hours. Does it sound better at the end of the gig? if it has 150 hours on it i'd think it's not going to get a whole lot better. No, I've always noticed it a practice. 150 hours should be MORE than enough. I am with you on HiFi speakers taking about 100. I would think that guitar speakers, if anything, should take less as they tend to be driven harder. I don't think it's going to get much better. That is my thought as well. The good news is they don't have to get any better (well, maybe the G12T-100, which might become something else soon, if you know what I mean), as the V30 sounds good now. It just seemed strange to me that it was taking so long. In fairness, I don't drive the rig hard (mic it up to the PA), so maybe that is why. The Celestion rep, Rick Skillman said about 250h-300h for for full break in, and i tend to believe that as i've a pair of 15 years v30 well over the 300h of loud playing, they just sound fantastic. When i heard brand new v30 i couldn't believe it was the same speaker. For my Celestions (V30 and G12H) I felt that sufficient improvement had taken place after 50-60 hrs. (probably mostly in the 95 db range). I have a 2X12 cab w/ WGS speakers that took in excess of 100 hrs. before I felt they were satisfactorily broken-in. Of course, "break-in" technically goes on forever. I've been hyper sensitive the break-in of Celestions (G12H30s mainly) in the past. The last amp I got was a Redplate TweedyDrive with V30. I think Henry at Redplate is treating the surrounds prior to install...I can tell you that I simply have not even thought about speaker break-in this time, but maybe that's more reflective of a V30 combined Henry's great Tweed circuit. I do know that the guys who have bought these amps with the V30s, Classic Lead 80s and other Celestions have not been too overly concerned with speaker break-in. So it might be worth contacting Celestion about that treatment, it was their rep who showed Henry. Don't speakers reach their perfect operating parameters at exactly 107 hours, and then begin to steadilly deteriorate? That's the reason for starting the thread, as I seemed to remember something like that - a rather long break in time. While that seems way excessive, my experience very well might prove it out. We'll see. 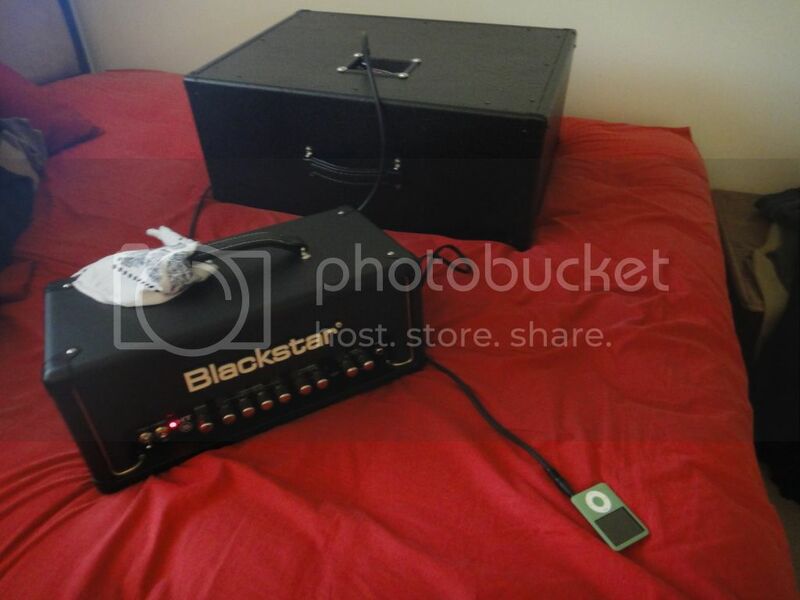 You have the iPod plugged into the amp's FX Return jack, I presume? I've got some made in England V30s with over 200 loud hrs on them and they sound pretty much the same as when I got them. Maybe a little smoother now. I've argued with guys on this very board about break in times on V30s. When I said 120+hrs, several of you told me I was nuts and that 50-60 hours was plenty. I don't know how many hours, but it takes a LONG time! The payoff is pretty cool though. It seems like loud clean would get you there quicker than lots of gain/distortion, which is compressed by it's nature. Big clean attack w/low end will get those speakers moving.